Made of durable pewter. Makes the perfect First Holy Communion gift. Also great for Confirmation, Birthdays, or any special occasion. 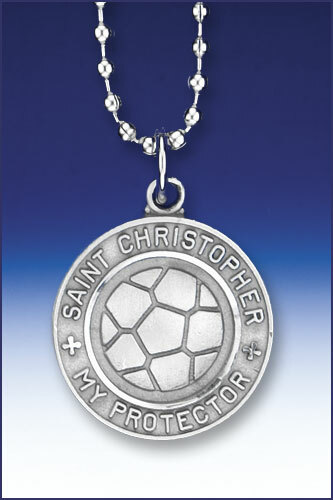 St. Christopher Sports Pendants feature sport subject on one side and Saint Christopher on the other. Sports medals are charms designed to protect the wearer, in the sport they are playing. They are a perfect gift for the young athlete! Saint Christopher is known as the "Christ Bearer". Christopher traveled the Earth on foot in search of adventure. In his travels, he encountered a young boy next to a stream whom he picked up and carried across the water. The boy was very heavy, and when he reached the other side of the stream, the young boy revealed that he was Christ. The reason the Boy Jesus was so heavy was because he was carrying the weight of the world on his shoulders.